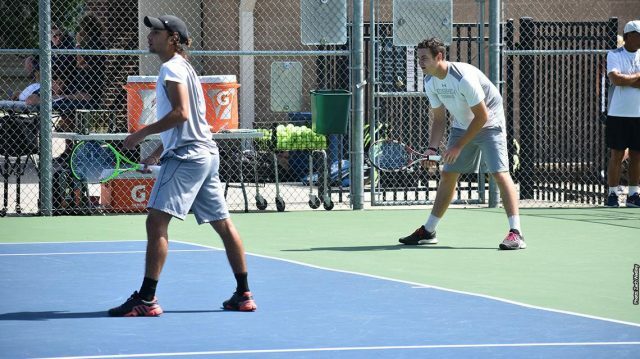 Goshen College men’s tennis team traveled to Indiana Wesleyan for the Intercollegiate Tennis Association’s Midwest Regional Tournament this past week. Students Danny Boussom and Martim Cafe paved the way to the doubles final. The duo defeated opponents from Taylor, Lawrence Tech, IU East, and Northwestern before losing 8-6 loss in the final to IWU. “It was a razor thin margin of defeat,” said Evan Atkinson, tennis director. The other Goshen doubles team, Josh Friesen and Kartikeya Sharma, won their first match against Northwestern Ohio with a final score 8-3. However, Friesen and Sharma faced the same team from Indiana Wesleyan for their second game, which ultimately led to their defeat. Four out of the five singles matches that were played had an advancement to the next round. Boussom made it the farthest of his teammates. He defeated Lawrence Technological University, Huntington University and Grace College before being defeated in the quarterfinal by the first seed Radu Popa, from Northwestern Ohio. Sharma advanced to the third round of matchups. He defeated representatives from Taylor and IU East before being ousted by the seventh seed, Marian University’s Diego Jesus. Two athletes met their end in the second round: Juan Miguel Ciudad and Friesen. Cafe was defeated in the first round of the tournament by Marian University, but he moved onto the consolation bracket, where he reached the second round. The Goshen College men’s tennis team will be back in action at Huntington University on Wednesday, Sept. 19 at 4 p.m.